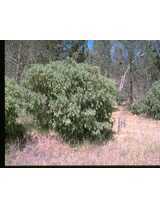 Description: Spreading shrub 1–4 m high, sometimes small tree to 8 m high; bark smooth, grey; branchlets pendent, ± terete, densely hairy. Phyllodes ± elliptic to ovate-elliptic or narrowly so, often slightly asymmetric, ± straight, 1–2 cm long, 4–10 mm wide, hairy or hairy only on margins, midvein prominent, lateral veins obscure, apex ± acute to obtuse with a delicate 1–2 mm long mucro; glands absent; pulvinus to 1 mm long. Inflorescences 8–25 in an axillary raceme; axis mostly 1.5–5 cm long; peduncles 2–4 mm long, hairy; heads globose, 10–30-flowered, 3.5–5 mm diam., yellow to bright yellow. Pods straight to slightly curved, ± flat except over seeds, ± straight-sided to irregularly and variably constricted between seeds, 3–11.5 cm long, 9–15 mm wide, thinly leathery, glabrous, pruinose at least when young; seeds longitudinal; funicle filiform, about as long as the seed with 1–3 folds, arilate. 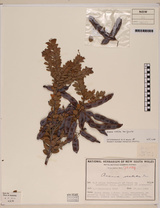 Distribution and occurrence: chiefly in the Wellington, Mudgee, Forbes, Bathurst to Cowra area; dubious records from near Bega (SC) in 1891 and from Bombala district (ST) in 1901; widely cultivated, occasionally naturalized. Grows in dry sclerophyll forest, often on steep slopes or sheltered gullies. 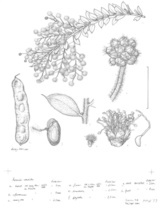 The name refers to the hairy nature of the plant. 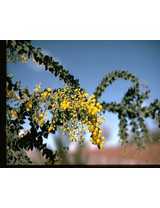 Widely cultivated, having an attractive, pendulous habit and adaptable to a variety of habitats and soils. May be tip pruned to maintain a compact shape.